The latest sourcecode is in the official boo repository at http://svn.boo.codehaus.org/trunk/extras/SharpDevelop/BooBinding/, here you can get slightly older binaries and source. Boo is a new object oriented statically typed programming language for the .NET framework with a python inspired syntax and a special focus on language and compiler extensibility. At the moment BooBinding includes syntax highlighting, code completion, project templates, a C# to Boo converter and a Boo interpreter pad. We use the google group boolang for discussion of boo and BooBinding. 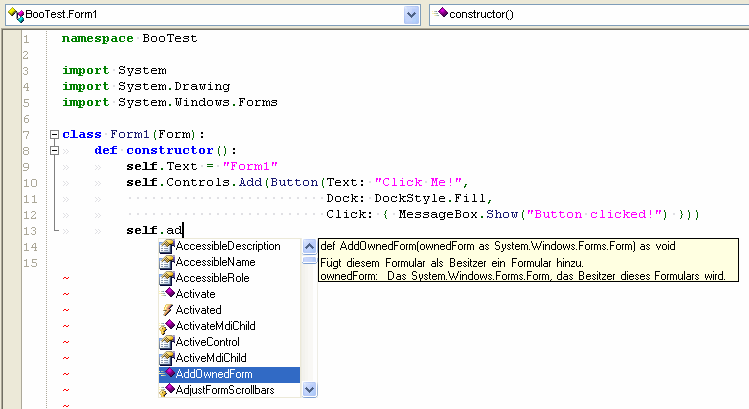 I recommend using SharpDevelop 2.0; it has a completely new version of BooBinding with Forms Designer already included! Binaries for BooBinding für SharpDevelop 1.1 RC 1 (1.1.0.2118) are not available anymore, please use SharpDevelop 2. The sourcecode of BooBinding for SharpDevelop 2 is included in the source code download of SharpDevelop.